Abdullahi allegedly stole a generator, a home theatre, a television, a stabiliser, a cable TV decoder, a CD player with speakers, and three cartons of non-alcoholic wines. The Punch learnt that the suspect had lied to his boss, Sandra Ibeh, that he was travelling to his hometown to see his mother who was sick. YOU MAY ALSO LIKE Fayose Reacts To Osun Election: "Democracy Is Dead In Nigeria"
In her statement to the police, Ibeh said she paid Abdullahi N10,500 out of the two months’ salaries she owed him to enable him to travel. “I promised to send the balance of his salary to his bank account the following day. I called him to confirm if he had got home safely and he told me he was home. “On August 16 when I got to my shop, I discovered that it had been burgled with some of my property carted away. I went to report at the police station. “I was advised to go to Ladipo Market where they sell fairly-used property, which I did. I saw some property similar to my own and I went to inform the police. The man I saw the property with was arrested,” she added. The businessman who was arrested in connection with the theft, Abubakar Yakubu, said he assisted in the arrest of Abdullahi. He said, “I used to buy recharge cards from Abdullahi. Through that he collected my phone number. He called me one day that he had some property to sell. 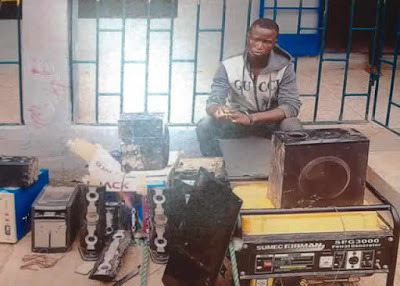 “I did not know anything until the police came to my shop and a woman pointed at the generator I put up for sale. The police arrested me and took the generator and three other generators. “I then remembered that he once told me that he wanted to sell some property. I called him to ask where he was and he told me that he was in GRA. Abdullahi was arraigned before an Ogba Magistrates’ Court on two counts of burglary and stealing. According to the police prosecutor, Abiola Adewale, the offences contravened sections 309 and 287 of the Criminal Law of Lagos State. The magistrate, W.A. Salami, granted the suspect bail in the sum of N80,000 with one surety in like sum. The case was adjourned till September 11, 2018.